The Settings Menu houses the configurable options in Krita and where you determine most of the “look and feel” of the application. Determines whether or not the dockers are visible. This is a nice aid to cleaning up the interface and removing unnecessary “eye-ball clutter” when you are painting. If you’ve got your brush and you know you’re just going to be painting for awhile why not flip the dockers off? You’d be amazed what a difference it makes while you’re working. However, if you know you’re swapping out tools or working with layer or any of the other myriad things Krita lets you do then there’s no point getting caught up in flipping the docks on and off. Use you time wisely! This is a great candidate to add to the toolbar so you can just click the dockers on and off and don’t even have to open the menu to do it. See Configure Toolbars below for more. 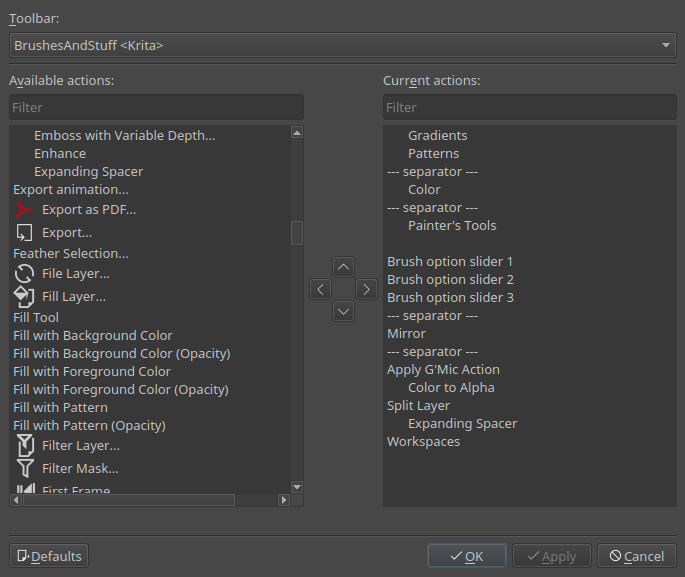 Krita subdivides the access of many of its features into functional panels called Dockers. Dockers are small windows that can contain, for example, things like the Layer Stack, Color Palette or Brush Presets. Think of them as the painter’s palette, or his water, or his brushkit. Learning to use dockers effectively is a key concept to optimizing your time using Krita. There is no easy way to create and share themes. The color themes are defined in the Share ‣ Color Schemes folder where Krita is downloaded. Configuring shortcuts is another way to customize the application to fit you. Whether you are transitioning from another app, like Photoshop or MyPaint, or you think your own shortcut keys make more sense for you then Krita has got you covered. 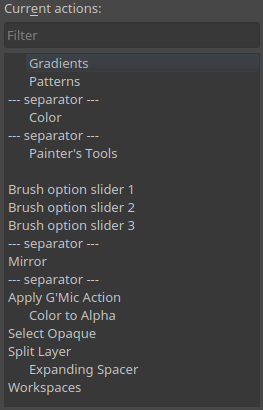 You get to the shortcuts interface through Settings ‣ Configure Krita and by choosing the Keyboard Shortcuts tab. Click on Group Layer and a small inset box will open. Click on the first button and type the Ctrl + G key combination. From this point on, whenever you press Ctrl + G you’ll get a new Group Layer. Smart use of shortcuts can save you significant time and further streamline your workflow. Manage the resources. You can read more about it here. If you wish to use Krita in a different translation. All the actions currently assigned and the order they are in. Use the arrows between the Available and Current actions sections to move items back and forth and up and down in the hierarchy. This type of inclusion/exclusion interface has been around on PCs for decades so we don’t need to go into great detail regarding its use. What is important though is selecting the correct Toolbar to work on. The File Toolbar allows you to add items between the New , Open and Save buttons as well as to the right of the Save button. The Brushes and Stuff Toolbar, lets you modify anything from the Gradients button over to the right. This is probably where you’ll do most of your editing. You’ll notice that some of the items are text only and some only icons. This is determined by whether the particular item has an associated icon in Krita. You can select anything from the Available section and move it to the Current one and rearrange to fit your own workflow. If you add so many that they won’t all fit on your screen at once, you will see a small chevron icon appear. Click it and the toolbar expands to show the remaining items. Gives a list of toolbars that can be shown.